Sharjah and Ras Al Khaimah governments will jointly set up the regional unit of Arab Academy for Science, Technology and Maritime Transport in Khor Fakkan, a city located on the east coast of the UAE, facing the Gulf of Oman. The foundation stone for the Arab Academy was jointly laid yesterday (April 13) evening by HH Dr Sheikh Sultan bin Muhammad Al Qasimi, Supreme Council Member and Ruler of Sharjah and HH Sheikh Saud bin Saqr Al Qasimi, Supreme Council Member and Ruler of Ras Al Khaimah, reported state news agency Wam. The new branch of the Academy will grant students a bachelor's degree in applied and theoretical sciences. Dr Sheikh Sultan later inaugurated the Khor Fakkan Lakes and the Fountains Project at the entrance of the city of Khorfakkan, which consists of 4 huge lagoons adorning the four sides of the city’s entrance square, it stated. 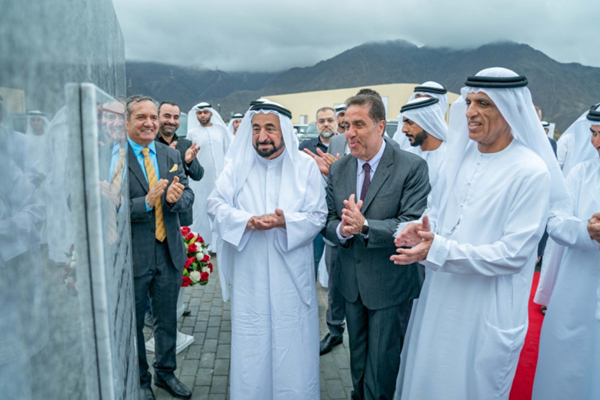 Sheikh Sultan bin Mohammed bin Sultan Al Qasimi, Crown Prince and Deputy Ruler of Sharjah was also present at the foundation stone laying ceremony. The Sharjah ruler also unveiled the Resistance Monument, which bears a historical and symbolic significance for the city's authentic heritage, and is a testament to the steadfastness of the Khor Fakkan people in the face of the Portuguese invasion in the early 15th century. The monument rises on the entrance of the city and takes the form of a helmet that symbolises the resistance that took place in this city, stated the report. The site of the monument was designed in a way that makes it a park for the public, adding more beauty to Khor Fakkan and enhancing its tourist attractions, it added. Later on, both the rulers went up to the top of the mountain, where the unique Al Rabi Tower sits, which is distinguished by its unique architecture, to unveil the memorial plaque of the tower known as "Burj" that dates back to 1915, during the reign of Sheikh Saeed bin Hamad bin Majid Al Qasimi. The tower is characterised by its multi-shaped geometrical design and its distinctive visual view overlooking the city. The tower, part of the series of observation towers, was regarded as the first defence line to face the greedy invaders, said the Wam report. Then, they moved to inaugurate "Al Adwani Tower" located on a hilltop near the port of Khor Fakkan. This tower was built in 1623 AD by Sheikh Kayed bin Hamoud Al Adwani Al Qasimi, and was characterised by its unique shape, and was used as a coastal lighthouse to lead ships to the port site, stated the report. Later the Sharjah ruler unveiled the memorial plaque for the excavations of the ancient Khor Fakkan wall and toured the renovated buildings surrounding Khorfakkan fort, it added.